The number of disclosed financial settlements between the House of Representatives and employees who alleged that they were harassed or otherwise wronged at work rose to 41 cases at a cost of nearly $1 million, according to newly released information dating back to 1996 published by the House Administration Committee. The settlements burst into the spotlight when BuzzFeed reported that Rep. John Conyers, D-Mich., paid $27,000 out of his office budget to a woman who said she was fired for refusing his sexual advances. High-profile stories about Reps. Raul Grijalva, D-Ariz., and Pat Meehan, R-Pa., who is on the Committee on Ethics, followed the initial reporting on Conyers. However, those settlements are not included in the newly released House data, suggesting that the actual number is significantly higher and raising questions about how insightful the statistics are. The three mentioned settlements were paid with the members’ office funds and brokered by the Office of House Employment Counsel. Meanwhile, the widely-cited data presents a different source of settlements—those managed by the Congressional Office of Compliance and paid out of a special fund at the Department of the Treasury. The Office of House Employment Counsel was acting as members’ lawyer and “[it] has attorney-client privilege with House employing offices, which is why the Committee wouldn’t have insight into their confidential discussions,” Erin McCracken, a spokeswoman for the Administration Committee, told The Daily Caller News Foundation in an email. McCracken did not respond to a question about whether such privilege would preclude the release of aggregate statistics without identifying information, or whether the committee had pressed it for such statistics, as the Office of House Employment Counsel would have the most comprehensive list. The Employment Counsel Office did not respond to a request for comment by The Daily Caller News Foundation. McCracken said the committee’s statistics focused on settlements that were brought to it by the Office of Compliance for approval under the Congressional Accountability Act of 1995. “The Committee was only alerted to settlements that involved the use of the Treasury account to settle a claim,” she said. 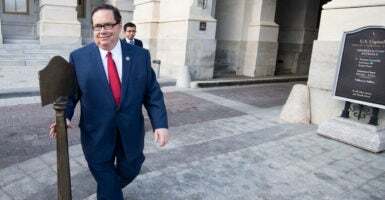 “Under House Rule 10, settlement amounts derived from a [Congressional Accountability Act] claim involving a House office would have to receive joint approval from the Chair and Ranking Member of the Committee. Under this rule, anonymized facts of the House case would be provided to the Chair and Ranking Member. The record of approved amounts from House cases dating back to 1997 is what the OOC provided to the Committee and we released that information,” she continued. Rep. Gregg Harper, R-Miss., chaired it this Congress, replacing a series of Republican chairmen who are no longer in office. The committee has proposed a bill than would ban members from paying future settlements from their office funds. Luke Rosiak is an investigative reporter for the Daily Caller News Foundation.